President Michel Suleiman , who is in Brazil on an official visit addressed the Lebanese expatriates in Sao Paolo on Friday and told them that Israel knows that Lebanon is no longer an easy target and therefore can no longer launch an offensive against Lebanon as it pleases . Addressing Israel’s threats against Lebanon, he said that the Jewish state is getting ahead of itself. In addition, he said that Lebanese national unity is the fundamental strength in confronting Israeli threats, stressing the harmony between the army, people, and Resistance. 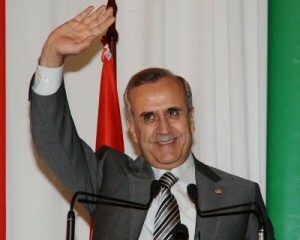 Suleiman encouraged the expatriates to make investments in Lebanon, reminding them that they have been granted the right to vote in Lebanese elections effective 2013. During his visit, the president held talks with several Brazilian officials. Last Thursday he met with his Brazilian counterpart, Luiz Inacio Lula da Silva. 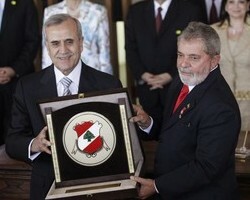 Photo: Lebanon’s President Michel Suleiman (L) awards Brazil’s President Luiz Inacio Lula da Silva with Lebanon’s Gilded Heraldry at Itamaraty Palace, in Brasilia April 22, 2010.